Another week in Concordia! We're finally starting to get settled in, but the pace still hasn't slowed down one bit. This last week, the assistants, Elder Gomez and Elder Oldham, came and did divisions with us. They got here Wednesday night (and we celebrated my birthday together), Thursday we worked together in our area, and then Friday I went with Elder Gomez and Elder Oldham went with Elder Frey, and we did divisions with other missionaries in Concordia. Me and Elder Gomez went to Universidad where we were with Elder Fajardo and Elder Garibay. It was an MTC district reunion!! We were just missing Elder Jaramillo and we would have all been there. Elder Gomez and Elder Oldham headed home Saturday morning, so they were with us for a good part of the week. We got a lot done, and made some great plans to be better missionaries. We are still playing the finding game. Our one solid investigator decided to drop us this week. :( She was progressing really well, but her uncle, who is an evangelical pastor, found out she was talking with Mormon missionaries and started filling her head with a bunch of things about Mormons, and she decided she didn't want to talk anymore. We were sad, but hopefully she can accept the gospel further along. We found some great new investigators this last week, and as we slowly build our investigator pool, we have lots of faith that there can be lots of baptisms in Nebel in the coming months. The members are getting involved, and it is just exciting to be a part of everything, of this great work the Lord has called us to. And thus we see the great call of diligence of men to labor in the vineyards of the Lord; and thus we see the great reason of sorrow, and also of rejoicing—sorrow because of death and destruction among men, and joy because of the light of Christ unto life. The great question is that: if we have a testimony of the truthfulness of the gospel, why should we desire to do anything more or less than to perform the work to which we have been called, the work of salvation of the souls of men? We came to the earth for one purpose, and one purpose only: to gain salvation and exaltation by living the gospel of Jesus Christ, and to help our brothers and sisters to gain that very same privilege. In that light, any other "purpose" in life is empty and void of real reward. May we all reflect on this question and think about what we can do this coming week and month to more greatly consecrate ourselves to the work of the Lord. There was a ton of fog the day that we went out with Elder Gomez, it was already starting to lift, but when we first got up, you could barely see the other side of the street. Presidente and his new granddaughter that was visiting! Last week of office pictures: Me and Hno Gonzalo Paz, the South America South Area mission accountant. In our mission leadership conference, we took a picture with all the elders who were there who were in my group (there's alot). Hna White was also in our group (and conveniently was wearing white that day), so they put her in a chair, and then Hna Perez gave her a bouquet of flowers to hold jaja not sure why, but it was a fun picture. We all looked at it afterwards and started laughing because it looked like some kind of bridal picture jaja oh well. Me and Elder Guevara! (he finished his mission this last week) I'm wearing his Pokemon hat, because he would go around and "capture" missionaries with his Pokeball hat and then take pictures with them. 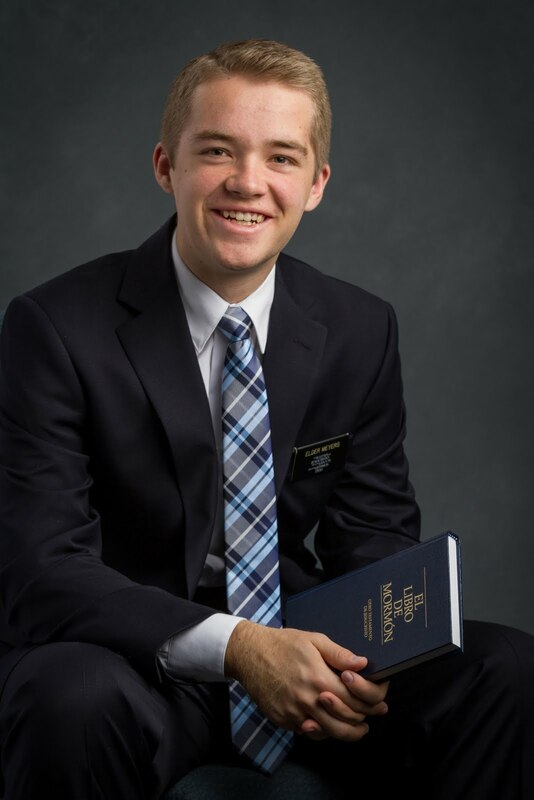 He was an awesome missionary.